LEAP Students were eager to start our final day in Austin. After grabbing a quick breakfast at the hotel, we headed to the Capitol to meet up with the Austin Interns. 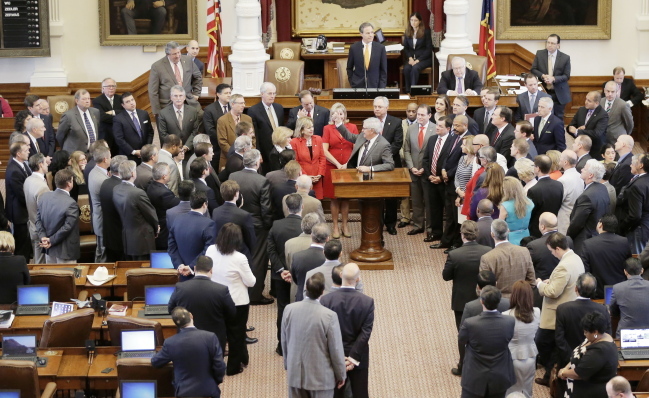 For the interns and capitol staff, today was an exciting day because it marked the end of Texas’s 84th Legislative session. 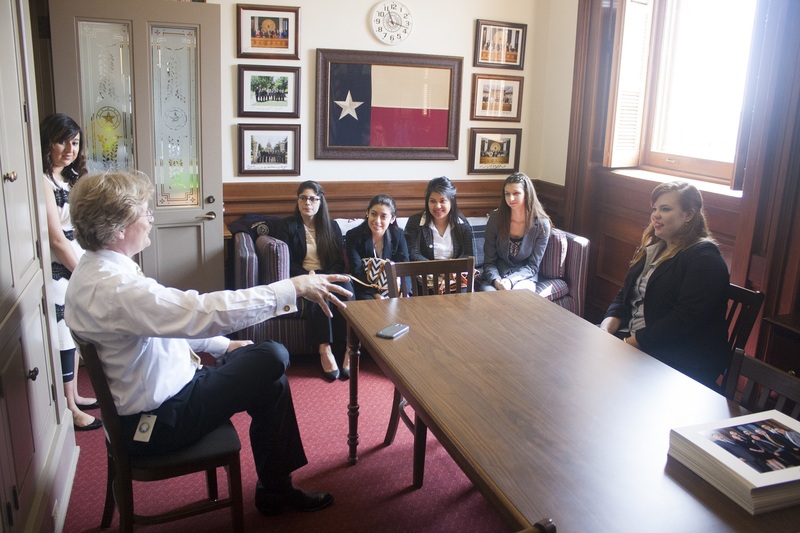 For LEAP Students, it was an exciting opportunity to see the Texas Legislature in action. A Junior Fellow Alum and present Advance Aide for Governor Abbott, Blake Roach arranged a photo opportunity for the Sam Houston Interns and LEAP Students! 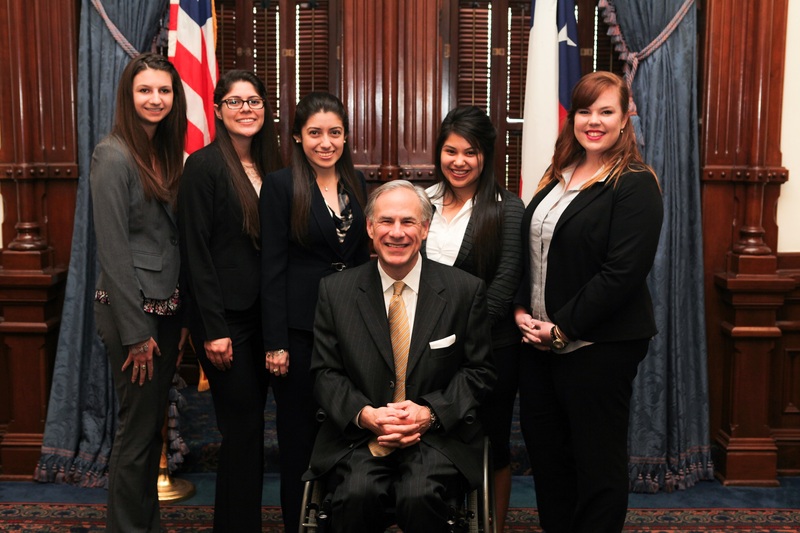 It was such an exciting opportunity for us as we were invited to meet Governor Abbott. Meeting Governor Abbott was the highlight of our weekend and made our trip unforgettable. Not only did Governor Abbott schedule time out of his busy day to take pictures with us, but he also was very personable and friendly. Many thanks to Governor Abbott for taking time out of his incredibly busy day and to Blake Roach for arranging this memorable meet and greet. After meeting Governor Abbott, LEAP Students and the Austin Interns hurried over to the House Gallery to hear the resolution and recognition of the Sam Houston Interns by Representative John Otto. It was a memorable experience for the Austin Interns to be recognized for all their hard work during the session. For visiting LEAP students, the entire experience should provide much motivation to work hard and stay focused on the goal of interning during the next legislative session. After watching all of the Austin Interns get recognized by Representative Otto, Sadie McLaughlin, one of the Interns, gave us a tour of Representative Otto’s Office. While at Representative Otto’s office we met up with Melva Gomez who was a previous intern and is now serves as an administrative aid for Representative Otto. Melva shared her adventures as a staff member with all of us, while crediting the Austin Internship program and the Junior Fellows for all of her wonderful opportunities. Invited by Alexis Gonzales, another Austin Intern from SHSU, to take a tour of Armando Martinez’s office, we left Representative Otto’s office on a mission. In Representative Martinez’s office, Scott Jenkines, the chief of staff for Armando Martinez, kindly greeted us. We were able to sit down with Mr. Jenkines while he answered any questions that we had and gave us insight about what occurs during the 140 days in session. Jenkines also showed us his black Lucchese cowboy boots that were stitched with the House of Representatives logo, which I thought were pretty cool. Alexis was also there to give us information about her life as an Intern at the Capitol. 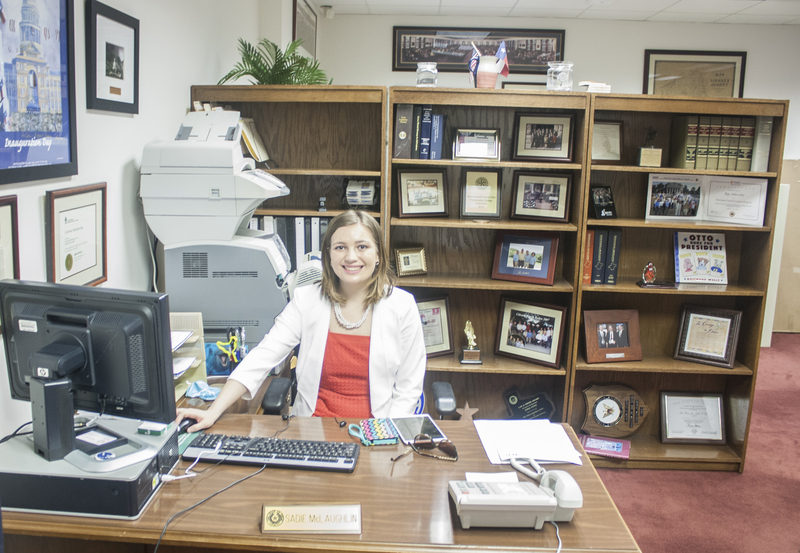 She told us about her extremely rare experience of walking on the House floor without begin stopped and let us know that anyone wanting to be a future Austin Intern must be able to work with a flexible schedule. The tours of the offices allowed us to learn more about what happens in the capitol and gain great insight into the experiences of the current Austin Interns. We left the Capitol overwhelmed by the awesome opportunities awaiting us in our future endeavors, although that did not stop us and our grumbling bellies in search for lunch. We made a quick stop at Whole Foods Market to eat, after windy through the huge amount of Austonians aiming to satisfy their hunger as well. Satisfied, we got back in the car and made our way home, whilst discussing the weekend and everything we had learned. Not many college students can say they understand the running of a campaign or have met the governor, but we can attest to both. Safely in Huntsville once again, we left each other ready for some good sleep and hopefully the next adventure LEAP throws at us.